Almost 12 years ago exactly I had business in Florida and brought Steph and baby Caden with me. We stopped by the Kennedy Space Center but given Caden’s age at the time and the high price of tickets we decided to wait until another visit to explore the facility completely. So here we are 12 years and 2 additional kids later. Back at the beginning of our adventure we did some space stuff as we gazed out into the heavens at a star party at McDonald Observatory near Fort Davis Texas. And now we are going to do more space stuff here at Kennedy Space Center. Ha…I bet you thought I was going to write about how we need more space in our house! Shuttles and Rockets and Space Men Oh My! The Kennedy Space Center was awesome! I had an amazing time! We saw a few people dressed up as astronauts but that wasn’t the cool part. 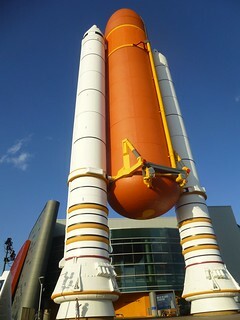 There were at least ten rockets, one of which was huge and there was the shuttle Atlantis. We got to experience one of the best launch simulators which was really cool. After the simulator, to get back to the main building, you’d walk down a ramp and it had all of the shuttle missions, and their crew. We saw our friend Joe Tanner. He was on four shuttle missions and the funny thing was, on two signs it said Joe, and on the other two it said Joseph. There was a rocket garden with a bunch of the rockets from Mercury, Gemini, and Apollo missions. The enormous Saturn V was in another rocket hanging from the ceiling and man it was huge! We saw an IMAX movie about exploration and mostly the new SLS, Space Launch System, and the capsule, Orion. Its a brilliant design and idea, and the coolest thing is, I am the perfect age to ride that rocket to Mars in the future! In the Atlantis building of course there was the Atlantis, and the launch simulator with the spiral ramp, but there was a second level where it showed what Atlantis’ reentry was like. You would start running and go up on a little tilted ramp, and if you didn’t try hard enough, which the Atlantis couldn’t, you’d go back down onto another then do it again and again and again. Here’s a picture I drew: After that little bit we waited in a little line to go down a steep slide that leveled out at the end. When it was my turn I raced Dacen. that wasn’t the fun part though. It was so fast and it felt like one of the huge waterslides at Water World without the water. Easily one of my favorite parts was, well the entire Saturn V building. I loved seeing the size of The rocket, the little astronaut van, the vault with some moon stuff and a journal thing that looks a lot like my math notebook. As I told you, I liked the whole building. I also liked the huge Rockets that carried the shuttle to space. They weren’t as big as the Saturn V but they were still huge. Here are some existing rockets. 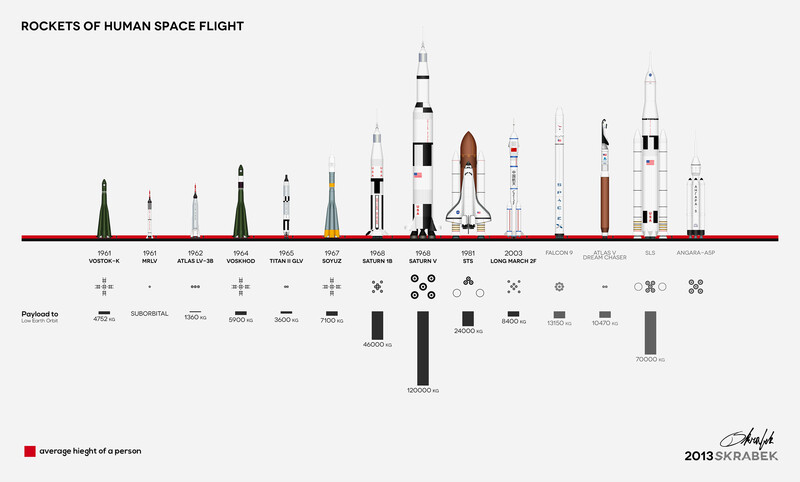 Saturn V is the tallest one with the Shuttle next to it. As you can see, there is a huge difference. Here’s me and the SRBs (solid rocket boosters) and ET (external tank) of Atlantis…I’m there at the base of the left booster. P.S. If you haven’t watched the movie The Martian, Its in redbox right now and its really cool and has a lot of the things that they’re working on right now, like Orion. Steph already told you about our search for a place to stay near the everglades. But I have a few things to say about it too so I’ll share them with you now. On the drive from the Keys, Steph took a short video of me giving my 2 month roadaversary update. In there I stated “my hope going forward is that we meet more people and engage in more conversations”. So keep that in the back of your mind as you read this. I’m a land lubber. Born and raised in CO. I took just enough swimming lessons as a kid to make sure I could save my own life if I ever fell into some water. Water activities are not my favorite especially when they involve putting my face in the water. I first snorkeled in high school in Belize, then on our honeymoon in Cancun. It was amazing but it just stressed me out. This Easter we got snorkeling gear from the Easter bunny and we were just a short drive from Key Largo so we set off for a day trip to snorkel at John Pennekamp state park. This post actually starts on Saturday, the day before Easter. Steph was sure Dacen had caught whatever crud Brielle had so she took him to the doctor to get him antibiotics. Brielle, Caden and I hung around the trailer doing work/school work. 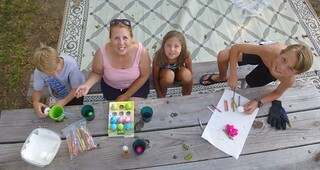 In the afternoon we dyed eggs. I’m not sure what it is about this activity but I am always surprised about how fun it is. Our favorite way to decorate is while the eggs are still piping hot we use crayon to partially decorate the eggs. Then we use the little pellet dyes that use vinegar. This combo makes for some very vibrant eggs. Dacen got up enough energy to do a couple but the poor kid was dragging big time. Sawgrass, Managators, and Sausage All in the Everglades! 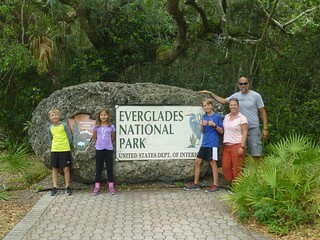 Ever been to the everglades? I used to watch CSI Miami. Anytime Horatio and the gang were in the everglades it meant someone was dead…the everglades are a scary place you know. After some eerie swamp footage Horatio would put on his sunglasses while he said some clever one liner like these. But the only things we were scared of during our visit were the mosquitoes…and maybe the vulchers. As our Life on the Move series continues we take a look at a few flat spaces in our rig…the table, the desk and the floor. Flat horizontal spaces always seem to accumulate things in a home whether it has wheels or not. The difference in the trailer is that there is less supply of horizontal flat space but no less demand for it.